We love grape tomatoes. They are great in salads, with bread and cheese or just as a quick snack. They often taste great at times of the year when larger tomatoes are lacking flavor. And, perhaps most importantly, they are practical for growing on our patio. A problem with tomatoes, large or small, is that they are feast or famine. You spend weeks and weeks looking at your tomato plants, willing for them to ripen. Then, suddenly they do - all at once. When we have an excess of larger tomatoes, we make hot sauce. When we have too many of the little guys, though, we have taken to oven-drying them. Slice them in half and arrange them cut-side-up on a sheet pan that's been lightly anointed with olive oil. 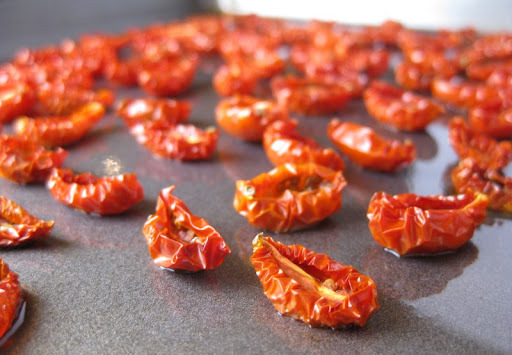 Put them in an oven at a very low heat for 6 to 8 hours, or until they've shriveled, but aren't dry and hard. "Low heat" can be tricky - we use our smaller, warming oven set to about 120 degrees. If you have a toaster oven, you can definitely use that. In a regular oven, just set it to its lowest setting and check after 3 to 4 hours. 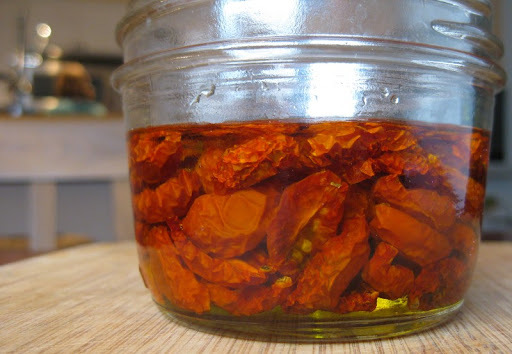 Once much of the moisture has been released, we pack the tomato "raisins" into jars and cover them completely in olive oil. Stored this way they will keep for months in the refrigerator (just be sure to keep the tomatoes submerged in oil as you use them). 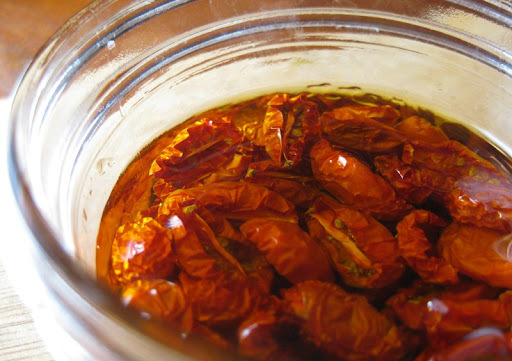 You can use these tomatoes just like you would any store-bought "sun"-dried tomatoes. Recently we have really enjoyed them as an accent flavor for hummus. Hummus may just be the most perfect spread ever invented. The next time you find yourself reaching for that tired jar of miracle whip, whip up a batch of hummus instead. 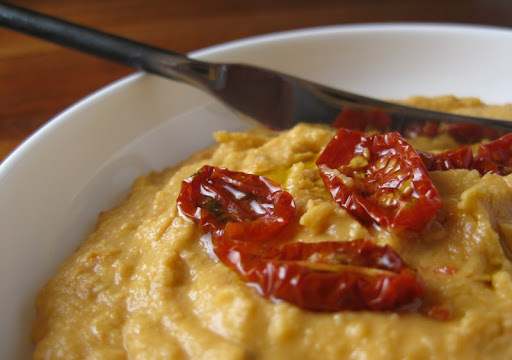 This is our go-to hummus recipe with the bonus addition of the tomatoes and hot sauce. We like it on the bright, acidic side. If that isn't your preference, you may want to reduce the lemon juice and/or up the amount of tahini. Put garlic into the food processor and pulse to mince. Add drained chickpeas and pulse again. 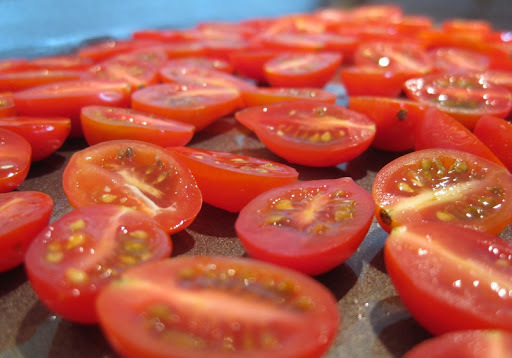 Scrape down sides of bowl and add tahini, lemon juice, olive oil, salt, tomatoes and hot sauce. Blend until smooth, scraping sides of bowl as needed. Taste and supplement any of the ingredients if needed. The last picture just gave me the inspiration to put the oven dried tomatoes (and a bit of the oil) on soft, scrambled eggs. How amazing does that sound?!? I've tried this once before in the oven and it turned out quite well. Don't know why I was so surprised but it was great. I think a whole half pan lasted for a few months in the fridge. I loved putting them directly on a toasted bagel with cream cheese. The hummus recipe sounds good. I'm always looking for recipes to try since we always seem to have an abundance of chick peas at home. Thanks for the recipe! Hillary - I bet they would be fantastic over scrambled eggs. Mike, smoked salmon actually sounds really good with all of it. Possibly a bit of flavor overload but I wouldn't say no! Maybe whip up the salmon in the cream cheese. We haven't tried them with smoked salmon yet, but we had some on bagels with cream cheese and smoked yellowtail yesterday. Very tasty!